This webinar was part of Love Your Data Week 2018 (12 -16 Feb 2018). to take a tour around the research data lifecycle, - to learn about best practices in data management to make research data findable, understandable, sustainably accessible and reusable. provide guidance to early career scientists, from planning, organising, documenting, processing, storing and protecting data to sharing and publishing them. Besides an overview of the guide and how to navigate it, the trip will zoom in on data management planning and key legal and ethical considerations in creating shareable data. 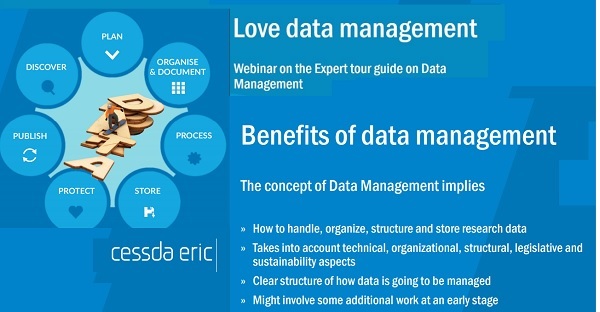 Along the way, illustrations and examples, as well as expert tips and insights into data management practices in different European countries lighten up the journey. *** Getting Ready for GDPR. The EU General Data Protection Regulation (GDPR) comes into effect on May 25, 2018. GDPR is the most important change in data privacy regulation in 20 years.